Paul lists the helmet of salvation as the fifth part of the armor of God. What does it mean for us today? How do we put it on, and how does it protect us? “And take the helmet of salvation” (Ephesians 6:17). When a soldier of the apostle Paul’s day suited up for battle, the helmet was the last piece of the armament to be put in place. In fact, without the helmet, a soldier would be so vulnerable that the rest of the armor would be of little use. Paul’s statement “take the helmet of salvation” is the shortest description given to any of the pieces of armor—it required almost no explanation in terms of its value. The Roman helmet, known as a galea, could vary quite a bit in design, since mass manufacturing didn’t exist at that time and each helmet was created individually. There was also some variation in the helmet design over time during the life of the empire. 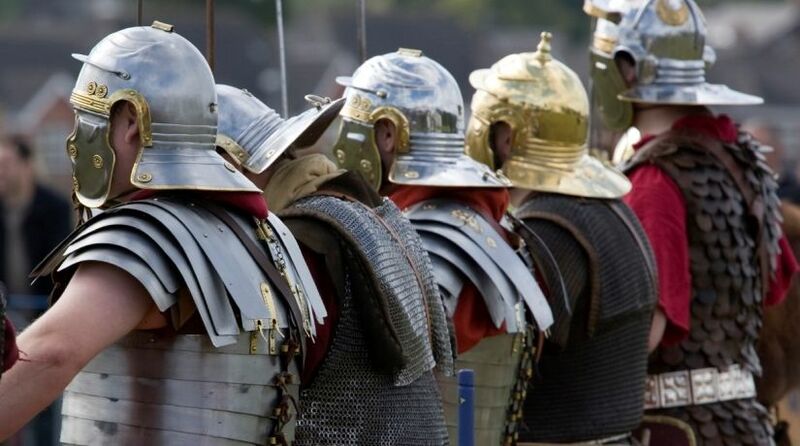 Usually the helmets were made of metal, though poorer soldiers or soldiers from the early days of the empire may have had leather helmets fortified with pieces of metal. The most obvious value of the helmet was to protect against blows to the head. Helmets usually had cheek plates to guard against blows to the face, and a metal piece in the back to protect against blows to the back of the neck. In addition, during the early first century the helmets began to include a brow ridge to provide protection for the eyes. Salvation means being saved—receiving deliverance. Notice what Paul said about what we are saved from and what we are saved by: “But God demonstrates His own love toward us, in that while we were still sinners, Christ died for us. Much more then, having now been justified by His blood, we shall be saved from wrath through Him. For if when we were enemies we were reconciled to God through the death of His Son, much more, having been reconciled, we shall be saved by His life” (Romans 5:8-10). What is the “wrath” we are saved from? It is the wrath of God against sin. Since we have all sinned, the penalty we would all face without the sacrifice of Jesus Christ is eternal death. “For the wages of sin is death, but the gift of God is eternal life in Christ Jesus our Lord” (Romans 6:23). Salvation and eternal life are gifts God greatly desires to give to mankind: “For this is good and acceptable in the sight of God our Savior, who desires all men to be saved and to come to the knowledge of the truth” (1 Timothy 2:3-4). Salvation, as Paul points out in Romans 6:23, is “the gift of God.” It is not something we earn. However, is salvation simply given to us, regardless of what we do in this life? The Bible tells us to “repent, and let every one of you be baptized in the name of Jesus Christ for the remission of sins; and you shall receive the gift of the Holy Spirit” (Acts 2:38). In order to receive forgiveness of sins, we must repent and be baptized. We also need to walk in God’s ways: “Therefore lay aside all filthiness and overflow of wickedness, and receive with meekness the implanted word, which is able to save your souls” (James 1:21). For more information about salvation, please see “What Is Salvation?” and “How to Be Saved” on this website. What does a helmet have to do with salvation? A helmet protects a soldier against damaging and deadly blows to the head. Spiritually speaking, the helmet of salvation provides hope and protects the mind against anything that would disorient or destroy the Christian, such as discouragement or deceit. A helmet protects a soldier against damaging and deadly blows to the head. Spiritually speaking, the helmet of salvation provides hope and protects the mind against anything that would disorient or destroy the Christian, such as discouragement or deceit. The author of the book of Hebrews compares hope to an anchor, giving us stability and the ability to weather the worst of storms: “Thus God, determining to show more abundantly to the heirs of promise the immutability of His counsel, confirmed it by an oath, that by two immutable things, in which it is impossible for God to lie, we might have strong consolation, who have fled for refuge to lay hold of the hope set before us. This hope we have as an anchor of the soul, both sure and steadfast, and which enters the Presence behind the veil” (Hebrews 6:17-19). God’s promise to do His part in bringing salvation to us cannot be broken! The apostle Peter refers to this hope as a living thing—something that cannot decay, nor can it be defiled. It is something to spiritually motivate and sustain us throughout our lives. “Blessed be the God and Father of our Lord Jesus Christ, who according to His abundant mercy has begotten us again to a living hope through the resurrection of Jesus Christ from the dead, to an inheritance incorruptible and undefiled and that does not fade away” (1 Peter 1:3-4, emphasis added). In a world where nothing is permanent, the promise of salvation made possible by the sacrifice of Jesus Christ never fades away. It represents stability in an unstable world. It gives hope in the worst of circumstances, enabling us to fight against despair and discouragement! The helmet also protected the eyes of the soldier, enabling him to maintain physical vision. Spiritual vision allows the Christian to fix his or her eyes on the goal, pressing forward without distraction or detours. The apostle Paul set an example of pressing forward with his eyes on the goal at all times, and he urged the brethren of the church at Philippi to do the same: “Not that I have already attained, or am already perfected; but I press on, that I may lay hold of that for which Christ Jesus has also laid hold of me. Brethren, I do not count myself to have apprehended; but one thing I do, forgetting those things which are behind and reaching forward to those things which are ahead, I press toward the goal for the prize of the upward call of God in Christ Jesus. Therefore let us, as many as are mature, have this mind” (Philippians 3:12-15). With the helmet of salvation in place, a Christian can focus on the goal of salvation, imitating the life of Jesus Christ in order to reach the goal that He made possible for us. We have hope that can sustain us on the journey, and vision to lock our eyes firmly on the goal. What a valuable piece of armor the helmet truly is! A soldier going into battle without a helmet would have instantly exposed himself to the deadliest of blows. Leaving off any piece of the armor would have been dangerous, but to go without the helmet would have been unthinkable. We can no more afford to be without the helmet of salvation today. “For He put on righteousness as a breastplate, and a helmet of salvation on His head; He put on the garments of vengeance for clothing, and was clad with zeal as a cloak” (Isaiah 59:17). Salvation is the ultimate goal for a Christian. The armor to get us there is indispensable. Put on the helmet of salvation now! Learn more in our article “Put on the Armor of God” and our free booklet Change Your Life!